Book a three (or more) night stay at Cypress Inn that includes a Tuesday night … and get Tuesday for FREE! Select “Free Tuesdays” from the “Rate Type” drop down at the top of the reservation page. This will calculate the room rate to include a Free Tuesday. Your reservation confirmation letter will spell it out. Must book and stay between November 1, 2018 and January 31, 2019. Must call to book and mention “Free Tuesdays” to get a free Tuesday with your three night stay. 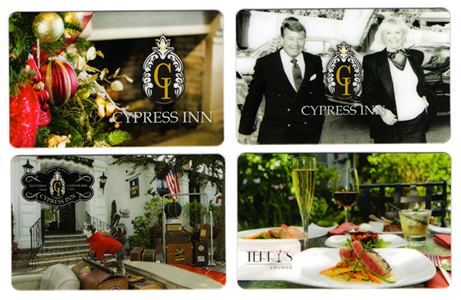 Must book direct with Cypress Inn (not through OTAs – booking & expedia). New reservations only. Based on double occupancy. This offer may not be combined with any other offer or discount. Blackout dates include Thanksgiving Day and December 24-January 1. Pet fees apply all three nights of your stay. Monterey County offers iconic California experiences by highlighting everything that’s best about the Golden State. There are few places on earth as incredibly dynamic and picturesque, with its rugged coastline, beautiful beaches, inland vineyards, world class golf courses and quaint seaside villages. There are dozens of memorable activities, both indoor and out, which cater to every taste and age. It was difficult narrowing our favorites to only ten, but here are the absolutely “don’t miss” vacation experiences for a trip to Carmel-by-the-Sea. One of the world’s best aquariums is a “don’t miss” for the whole family! “The greatest meeting of land and water in the world”, famed landscape artist Francis McComa’s bold but justified claim for the area. Leave the car in park and enjoy a superior wine-tasting experience on this self-paced, self-guided stroll to tasting rooms. Walk on the purple sand at Pfeiffer St. Beach, featuring an 80-foot waterfall that drops from granite cliffs into the ocean from the Overlook Trail. Explore the chic boutiques, antiques and galleries in the European-style seaside village of Carmel by-the-Sea. Let the day go to the dogs! An afternoon run on Carmel’s beautiful “leash-free” beach is sure to build up a thirst, to be quenched at “Yappy Hour” where you’ll mingle with locals and visitors alike at Cypress Inn’s pet-friendly “Terry’s Lounge”, co-owned by legendary screen star Doris Day. Mutt-tini, anyone?